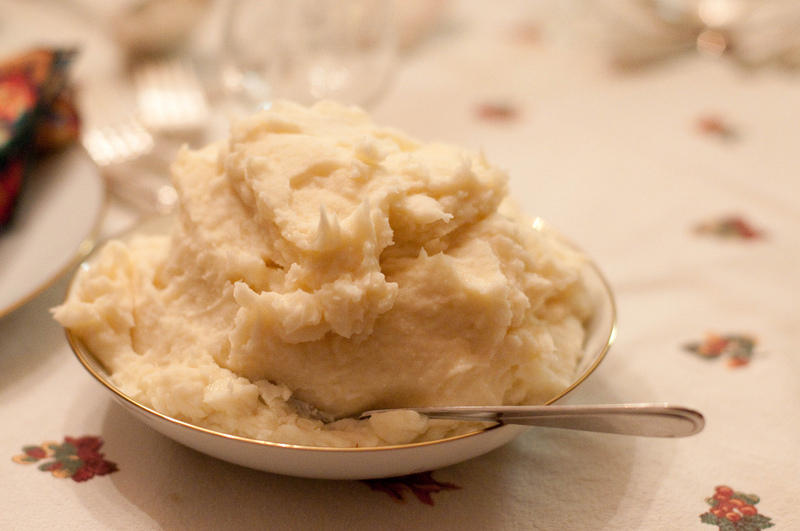 When senior contributor Chris Prosperi made these mashed potatoes we went crazy. They’re rich, creamy, and oh so perfect for turkey, or anything for that matter. Chris says it’s important to remember not to overcook the potatoes. Overheating causes the starch cells to burst and can make the potatoes gummy. For best results, Chris says, cook your potatoes at a slow boil and drain them well. Peel and rinse the potatoes. Cut into quarters. Put the potatoes in a 3-quart pot and cover with cold water by about 1 inch. Cover the pot and bring to a full boil over high heat, about five minutes. Always start the potatoes in cold water. 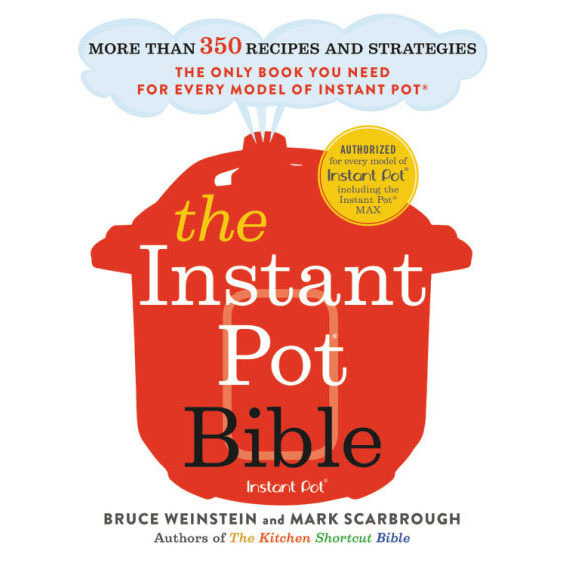 As soon as the pot reaches the boil, lower heat to medium and reduce the boil to a slow boil. Cook the potatoes for 35 to 4o minutes until fork tender. In the meantime, pour 2 cups of heavy cream into a small 1- or 2-quart saucepan. Add ¼ pound or 1 stick of butter and cook on low heat until the cream warms and the butter melts completely. Do not boil. Using a towel or oven mitt, take the pot of potatoes from the stove and empty into a colander placed in the sink. You'll see lots of steam rise up - let it go, the steam is taking some of the water out of the potatoes. Some professional cooks, so intent on a dry spud, place the cooked potatoes on a cookie sheet and stick in a preheated 300-degree oven to get rid of the water. You'll know the potatoes are ready to mash when the steam begins to subside and the edges of the potato quarters begin to look dry and rather white. Some people prefer their mashed potatoes passed through a ricer or a food mill for a smooth velvety paste. We like our mashed potatoes more rustic. Place the quartered potatoes in the pot or bowl. Sprinkle in 1 tablespoon of salt. Place the pan with the warmed cream and melted butter close to the potatoes so you can reach it easily. Take your masher and go once, gently, around the bowl or pot to break up the potatoes. As the potatoes crumble, they should look as flakey and fluffy as new snow. Pour in roughly ½ cup of the butter and cream mixture. Go around the bowl again to incorporate the cream mixture into the potatoes. Add a second ½ cup of the cream mixture. You want to add the liquid slowly; Once this second ladle of cream is absorbed add the third and finally the fourth ½ cup. You want to mix in a total of 2 cups of the cream and butter mixture into the potatoes. As you mash, push the masher slowly to the bottom of the bowl or pot and then drag it slowly toward you to incorporate the cream in the potatoes. Don't mix hard, you don't want the starch cells to burst. After you pour in the fourth and final ½ cup of the cream mixture, take a large spoon and slowly turn the mashed potatoes over once or twice to make sure the mixture has been fully absorbed. On the show the other day you mentioned making the potatoes ahead and then reheating. I was in the car and can not remember the technique for reheating them. Can you give me the details. Do they need to be at room temp. to start? I thought you mentioned something about brown butter with this recipe. Am I mistaken? I love how you’ve gathered all the Thanksgiving recipes together. Thanks for making things easy! Instead of a hand masher, can you use an electric mixer on low speed or will that burst the starch cells? Chris Prosperi says you can use a mixer on low speed. 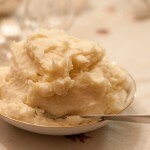 creamy mashed potatoes with gobs of butter…Thank you for all the wonderful tips and recipes. Wishing you all a very happy Thanksgiving filled with family, friends and fantastic food! 3 pounds, but by all means, scale up. Make big vats for your crowd (they sound like our kind of people, by the way). We’re wishing you a happy Thanksgiving as well. Thanks for listening, Suzanne! Hi Joan. Thanks for writing in. Chris says if you put enough butter and cream in when you make your mashed potatoes, you don’t necessarily need to add more when reheating. Happy Thanksgiving! Hi! I’m having trouble finding Idaho potatoes, will russet do ? Yes, Chris says that’s A-OK. Russets will make a delicious mashed potato. Happy Thanksgiving!